What's not lacking tho was in experience. One of the two climbing guides - Sherpa Alta, had done the Everest Marathon! The Everest Marathon is a charity marathon starting form Gorakshep until Namche Bazaar. 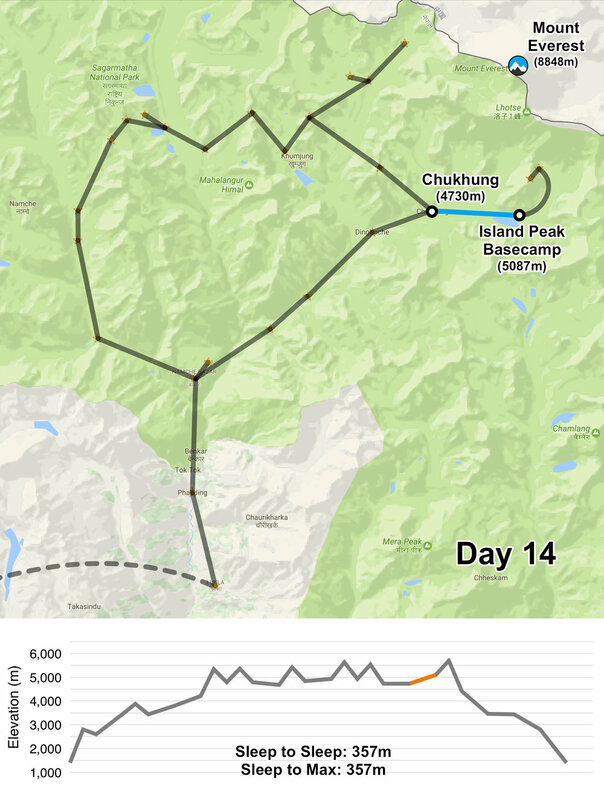 A loop from Namche Bazaar to Thamo is added to make up the full marathon distance. On top of that, he have already summited Everest 7 times! Island Peak is his off season job. He makes summit of Island Peak tens of times every single season. 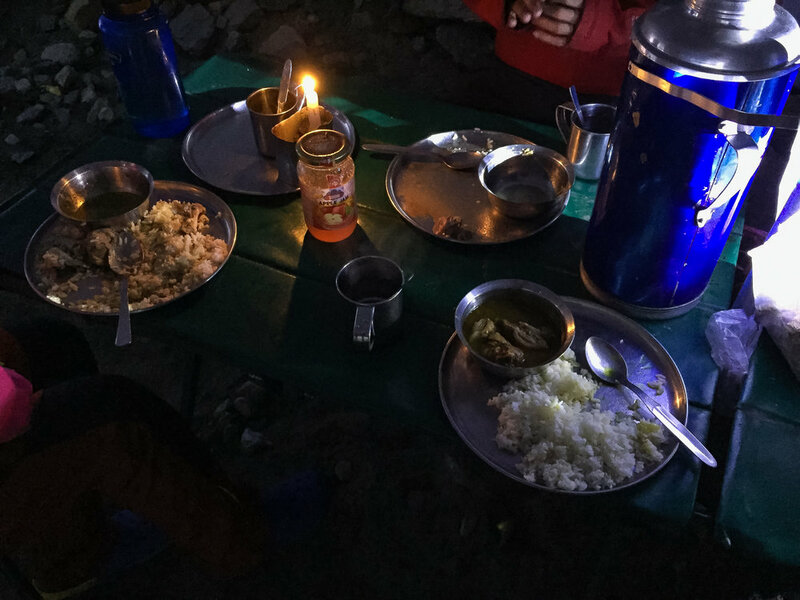 We got to Island Peak base camp with our relatively heavy backpacks, with our sleeping bags and climbing gear carried there by one of our porter. The walk to the base camp was unexpectedly long and once again I was barely able to keep up. I didn’t want to fall behind the climbing guide too much and risk having my ability questioned, and potentially discouraged from ascending Island Peak. At base camp we had a good Tuna pasta lunch. Inside the dining tent we were surprised to see the other Taiwanese group whom we have met a few times along our trek. They mentioned that for their group, they did not have to pay any extra fee for getting their gear to and from cramp-on point. And this was despite that their entire trek costing less than ours did! After lunch we tried on our gear to practice using the ascender and the figure-8 descender. Like the boots, most of the gear provided were incredibly crappy. Specifically the harness I was provided was heavy and yet did not have any gear loops! Upon complain a flimsy gear loop was made using just a piece of thin rope. This meant a one handed clip-in of unused gear was not possible given how flimsy the gear loop was! I would say the recommendation from some trekking companies' website to not bring your own sports climbing harness if you already had one, to be a bad idea. The harness provided definitely was not any better or any safer than the typical ones used for sports rock climbing. Practice was rather short and many felt under-practiced. We basically went through ascend and descend twice and that was it. I felt just okay, but that's because I have had a good amount of rock climbing experiences for the past 2 years, I couldn't imagine how the others would've felt ready and prepared. Once the sun got down, we had early dinner. Dinner was quite tasty, consisting of curry along with ample amount of chicken and rice. They came hot but the food cooled down quickly. The near infinite supply of hot water was quite welcomed tho. After dinner, knowing that we had to wake up around midnight to have breakfast and start our ascend, we retreated to sleep in our cold tents as early as 6pm. We woke up at midnight, packed our bags, left what we didn't need in the tents and headed for breakfast. Breakfast consisted of porridge and boiled eggs. I only had the porridge and forgot why I didn't bother with the boiled egg. During breakfast, we tried to fill our hydration packs, only to discover that many had problems with the drinking tubes frozen. That took some time as we tried pouring hot water both ways thru the tube to clear the blockage. They were resolved before we got started. We also started our hand warmers and put them into our gloves and socks. By the time we were all readied, it was 1 am. Lizhen for some reason called it quits after about 30 minutes, that is before the route even got steep. The other climbing guide - Tenzing, accompanied her back to camp. Shortly after, Longshen started to walk visibly much slower than normal. As such, Alta tried to manage our pace and had frequent stops to wait for Longshen. I took advantage of this and managed to keep up with the front of the group at a good pace. It would sound like we were going at snail pace, but in fact we were catching up to another bigger group despite of our frequent stops. Shortly after a longer washroom break, Longshen also decided to call it quits. While we were deliberating, Tenzing also caught up to us, back from escorting Lizhen to camp. We thought that our overall group pacing should be sufficient as we were able to pass a few groups. Also, the climbing guides made it so that at least 2 of us had to descend together. This was because one climbing guide had to accompany Longshen down to camp, that meant the other climbing guide had to carry the load of all 3 of our boots, cramp-ons and harnesses, which was deemed impossible. Longshen plead that he can just descend on his own. However the climbing guide insisted that any descend would have to be in twos. It almost seemed the climbing guides were delighted in the situation, as if they did not want to do the ascend either. I was quite pissed off as the situation, being unable to convince the Longshen to continue, nor able to convince the climbing guides to allow Longshen to descend on his own. Eventually Kilik, whom arguably have been the strongest hiker all morning, volunteered and descended with Longshen. The approximate elevation at this point was 5,450m. With just Tenzing, Bo and I, the pace quickened up considerably and we were passing quite a few groups. I was barely managing to keep up. The path started to become volcanic rock-like, requiring some light scrambling. This slowed the group down and I was able to follow more closely. I thought we were making very good progress, as all the headlamps I saw were behind us. From our vantage point, I saw absolutely no headlamps in front of us at all! I thought to myself that even if we go absolute snail pace from that point forward, there was simply no way we wouldn't make it to the top. That is with ample time to descend there-after. With Kilik giving up his spot for us, I thought it would've been a disservice to resign at any point going forward. I was quite determined to make it to the summit. We had a short break and Bo complained that his hand, particularly his fingers were painfully cold. Tenzing gave his hand a check and agreed that his fingers were unusually cold. The concern was frost bite. Apparently, perhaps through miscommunication, Bo was not using any hand warmers in his gloves as he gave them away to Longshen. He thought Longshen did not have any hand warmers, when in fact Longshen had the same brand's super warmers... Another observation was his backpack design, which doesn't look like a typical hiking pack, and had rather thin straps. Being the only one who decided to carry his full size full frame Sony Alpha along with 2 lenses, I suspected that his heavy backpack prevented good blood circulation, causing the condition. After descend and treatment with warm water, Bo and I retreated to the tent to get some warmth and sleep. The time was around 6am. I was rather disappointed that the summit attempt was aborted due to no issue of my own at all. I felt being let down by the team, especially by Bo. Neither was any attempt of apology being given by Bo on this matter either. This feeling of disappointment was definitely carried over to the entirety of the short remainder of the trip. I don't know if I'd ever have the opportunity to attempt Island Peak again. It took 2 weeks to get to where we were. Along with the battle with altitude and acclimatization, the entire approach to Island Peak was such a taxing experience that I am not sure if I can ever afford the time and energy to do it again. After sunrise we packed up and waited for Sanu, whom trekked in from Chukkung. He was to learn the bad news that we failed to summit. Perhaps to divert attention away from our failure, the discussion focus eventually shifted to the overcharge of carrying fees. This was unexpected news to Sanu, whom was determined to help us discuss with the climbing guides. Money matter, at least in that amount, was no longer of much interest to me at that point. Some partial amount was eventually recovered from the climbing guides, but nothing short of paying out of pocket for hiring some other climbing guides, and to stay in Chukhung for another few days, would have bought another opportunity for summit. We trekked back to Chukhung for lunch, before trekking down to Dingboche for dinner and lodging. We were avoiding alcohol thus far for the entire trip in fear that it'll induce or exacerbate altitude sickness. However from here-on, it's all downhill. As such we started our first day of drinking with some Nepali Khukri Rum bought to us by Sanu.